Los Angeles-born New York resident Atticus Mellor-Goldman studies with Julie Albers and Hans Jensen on a full-tuition Presidential Scholarship at the McDuffie Center. 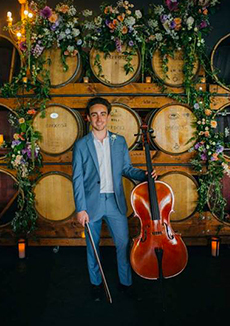 He spent two seasons with the American Youth Symphony in Los Angeles, has attended many chamber music festivals, and was one of two cellists to act as a cultural ambassador for NYU Abu Dhabi in 2014. In 2015 his quartet won the gold medal for the Junior Division of the Fischoff Competition. His performance of the Vivaldi Concerto for two cellos with the McDuffie Center for Strings ensemble was recorded for Performance Today.